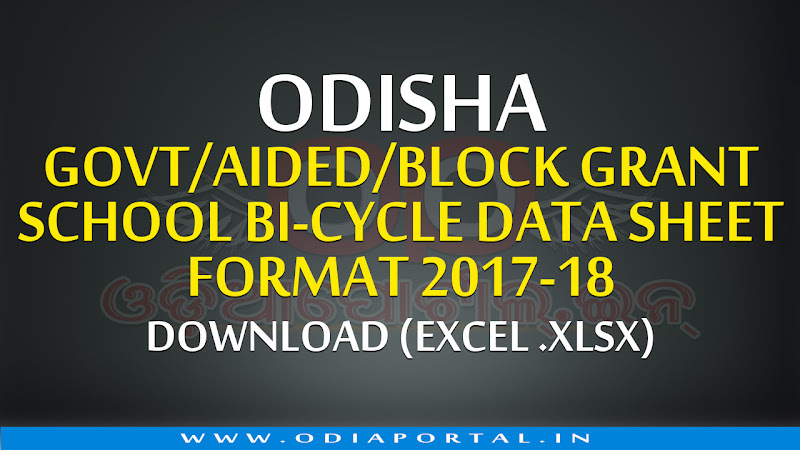 The following is the Pre-formatted Excel (.xlsx) format for Odisha Aided/Govt/Block Grant High School Bicycle Supply for Students for the year 2017-18. You can download provided format for your use for free. Share this page with others. Thank you! NOTE: Names of entire Girl students should be entered first followed by the names of the boys students as the case may be in the format given below. OdiaPortal.IN is always here to help every schools in Odisha & their Esteemed and most Respected staff. So, we prepared 2 separate Excel Sheet (MS Excel Vr. 2010) as per Official design and guidelines, You can easily download by clicking below button and may use in your work, (i.e. Bicycle Supply 2017-18 Class IX, X Students Data Collection & Input). We prepared the format for 50 students. If you want to add more students then you can add row for every single new students in the Excel software. While printing the final data on A4 paper please adjust paper margin with your printer printing area.